Crown of Midnight picks up more or less where Throne of Glass left off and it sets the mood perfectly within that first chapter for the rest of the book. Celaena is now the King's Champion but things are not quite as they appear to be and it's clear that it won't be long before things start getting very complicated. And deadly. Whew, where to begin? This is essentially a case where every single thing I enjoyed about Throne of Glass was stepped up a notch for the sequel. The characters grew; they became more complex and so did their relationships with one another. The story arc became darker and more intricate, setting up new elements, while also bringing in themes or plot points referenced in book 1. The mythology, which I was already a BIG fan of, grew, twisted and changed, all while keeping in perfect sync with what had already been established. Absolutely everything about Crown of Midnight was done masterfully by author Sarah J. Mass - so much so that I literally sat in awe once I read the final page at her sheer brilliance and epic storytelling skills. Prince Dorian, Chaol and Nehemia all displayed similar character growth but in vastly different ways, which made each of of their journeys that much more satisfying and engaging. Their relationships with one another also flourish in a satisfying and layered way. Sometimes it was surprising, times it was exciting...and then there were those times when it was gut-wrenchingly sad and earth-shattering. I just have so much love for all of these characters that I could easily imagine them all having their own solo adventures and me gobbling up every single one. 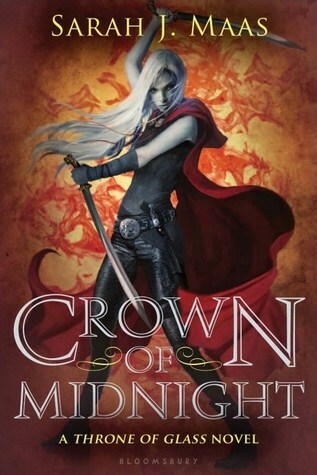 Overall, Crown of Midnight was a stunning and impressive follow-up to Throne of Glass. All the things I loved about the first book came back full force, and then some. If you're looking for a sequel that not only holds up to to it's predecessor but manages to step every element up a notch, then you need Crown of Midnight in your life. Right now! That ending though...that ending just might kill you O.O it was a close call for me *whew* but if you're lucky enough to survive, I can guarantee you'll be willing to crawl over your own mother just to get your hands on book 3. Sorry mom! I love when the sequel is even better than the first book need to check this one out! The first book was so hyped up that I actually avoided reading it because I didn't want to be let down, but it seems like people are really loving this series. I might have to give it a shot. I don't read a lot of fantasy either so I guess I just wasn't quite as excited for it as everyone else. I loved Crown of Midnight even more than Throne of Glass, too! The mythology and world building are just amazing! I also really liked the relationship parts! I'd love to say more but I don't want to spoil anything if someone reads this comment and hasn't read the book yet. Ahhhh I'm so glad you loved it!! Everyone MUST read this book! I do want to try Mistborn though bc I know I LOVE Sanderson's writing and his world building capabilities are amazeballs!! Yayyyy! I finally finished this and got to read your lovely review! ♥ I could not agree with you more that EVERYTHING about this book was turned up in intensity from Throne of Glass. I loved how dark this was and how extraordinarily badass Celaena was and Chaol- aaahhh. I just loved Chaol! And no, I don't know how we're going to survive the rest of the series! My heart went through so much abuse in this one! "This is essentially a case where every single thing I enjoyed about Throne of Glass was stepped up a notch for the sequel"<-- THIS. This is exactly what I want to hear. Because I mean, Crown of Midnight had a lot to live up to after the awesomeness of Throne of Glass. I'm actually a little surprised Maas managed to surpass it, but SO pleased and STOKED. It's killing me that I can't read this one right away. It'll have to wait, unfortunately! I can't wait to find out what these beloved characters get up to, how the story plays out, that ending!! And then will most certainly be willing to do unspeakable things to get my hands on book 3, as well! Here's hoping Maas can top herself again! I think she can. This was a stellar review, Mich!! Awesome review; I feel like this one was a great step-up from the first book and that one was really great as well! Maas' writing style is so good and I cannot wait to read more! What a fantastic review, Micheline! I'm so happy this sequel was awesomeness. I'm anxious to read it.